Contains premium organic and wild-crafted: Spruce, Patchouli, Chamomile Roman, Bay Laurel, Palmarosa, Carrot Seed, Rosewood, Niaouli, Clary Sage, and Ylang Ylang essential oils. Yin™ blend is part of our Meridian Aromatic Touch Modality™ which focuses on the freeing up the flow of energy throughout the body. 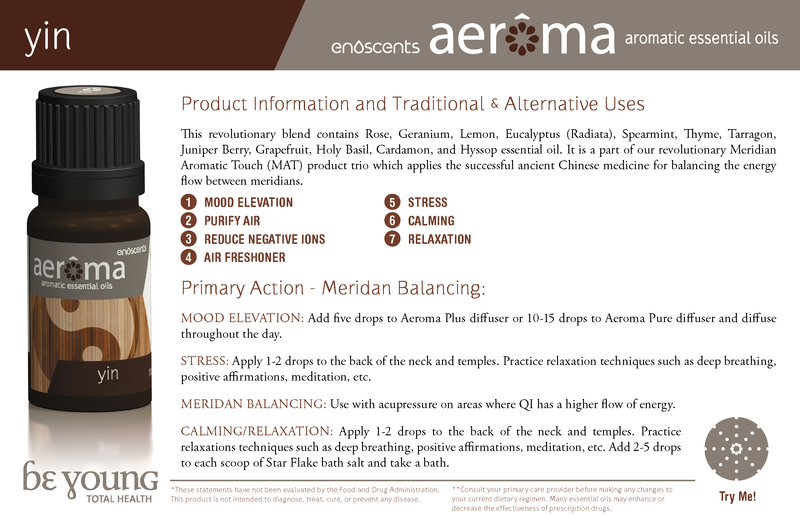 Yin™ blend was specifically formulated to lower meridian energy in areas where there is an excess of energy. Apply 10-15 drops to a diffuser. Apply 1-2 drops topically on an overactive meridian area. and linalool, the other is rich in 1-8, cineole. We certify that this batch conforms to specification for this product. Using Yang Blend with any other oil will help to decrease the action of that essential oil.